ALS Research Forum | Do Motor Neuron Firing Rates Rise, Then Crash, in ALS? Do Motor Neuron Firing Rates Rise, Then Crash, in ALS? Early on in amyotrophic lateral sclerosis motor, neurons fire like machine guns, but then they run out of ammo and go silent, according to a paper in the January 12 Nature Communications. Researchers from the University of St. Andrews in Scotland saw this pattern in motor neurons expressing TDP-43 mutations or C9ORF72 expansions, two genetic causes of ALS. They tracked these neurons over time in culture, and saw their firing rates initially elevate and then plunge, all before the cells showed other signs of disease. Finding the same problem in both types of neuron suggests that a common pathway could be at work in two kinds of familial ALS. These cultures would be a good testing ground for therapeutics, said study senior author Gareth Miles. Hamstrung by imperfect animal models, scientists have become excited to test theories and treatments in induced pluripotent stem (iPS) cells derived from people with disease. They can give those iPS cells a neural destiny to mimic neurodegenerative diseases in a dish (see Sep 2010 news). However, early experiments on the biochemistry of ALS neurons found they were not very different from control cells, Miles said. More recently, he and others have looked at electrical activity. One group observed diminished excitability in neurons with C9ORF72 expansions, while another reported hyperexcitability in cells with SOD1, C9ORF72, or FUS mutations (Sareen et al., 2013; Wainger et al., 2014). However, because the researchers looked at different time points in the life of the neurons, it is possible the cells may exhibit different activity at different stages. In the new study, first author Anna-Claire Devlin and colleagues followed cells for 10 weeks. First, collaborators in the laboratory of Siddharthan Chandran at the University of Edinburgh collected skin fibroblasts from one person with ALS due to a TDP-43 mutation, two with C9ORF72-based ALS, and three healthy control donors. 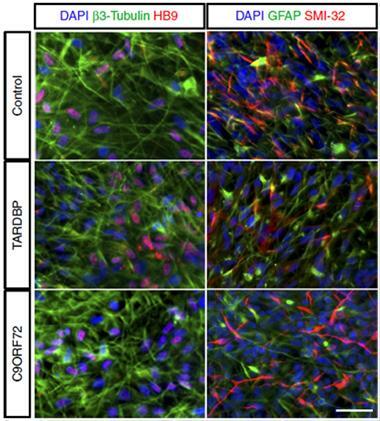 They turned the fibroblasts into iPS cells and then pushed them toward a motor neuron lineage. Then Devlin took over, spreading the cells on plates to allow the final steps toward a motor neuron fate (see image above). After a couple of weeks, many cells matured to a point where they were electrically active, firing repeated action potentials in response to stimulation. However, the ALS lines shot off more frequent action potentials for a given stimulation than the control lines. “They are definitely more excitable,” Miles concluded. However, as the cells aged, the percentage of neurons capable of generating action potentials decreased in the ALS lines. By seven weeks, many of those neurons fell silent, mustering no spike at all. This likely explains the conflict between the earlier papers, agreed experts who spoke with Alzforum. “[This paper] gives probably the best evidence to date for the idea of progression from hyperexcitability to reduced excitation,” said Brian Wainger of Massachusetts General Hospital in Charlestown, a member of the group that previously observed hyperexcitability. It is hard to say how that weeks-long progression in the dish compares to the decades-long development of ALS in a person, said Robert Baloh of Cedars-Sinai Medical Center in Los Angeles, who saw excitability drop in ALS motor neurons. The events Devlin and others observed might all happen during the development of the human embryo, he speculated. Therefore, researchers cannot be sure how relevant these excitability changes are to human disease. That said, several studies in mouse models and people with ALS back up the idea that excitability goes up or down as the disease progresses (Bories et al., 2007; Kanai et al., 2006; see also Related Papers below). What causes this up-and-down excitability? Miles was buoyed to see the same phenomenon in the TDP-43 and C9ORF72 lines. The two mutations could instigate a common pathway, perhaps via their effects on RNA processing, he speculated. Miles plans to explore in detail how excitability changes. Devlin AC, Burr K, Borooah S, Foster JD, Cleary EM, Geti I, Vallier L, Shaw CE, Chandran S, Miles GB. 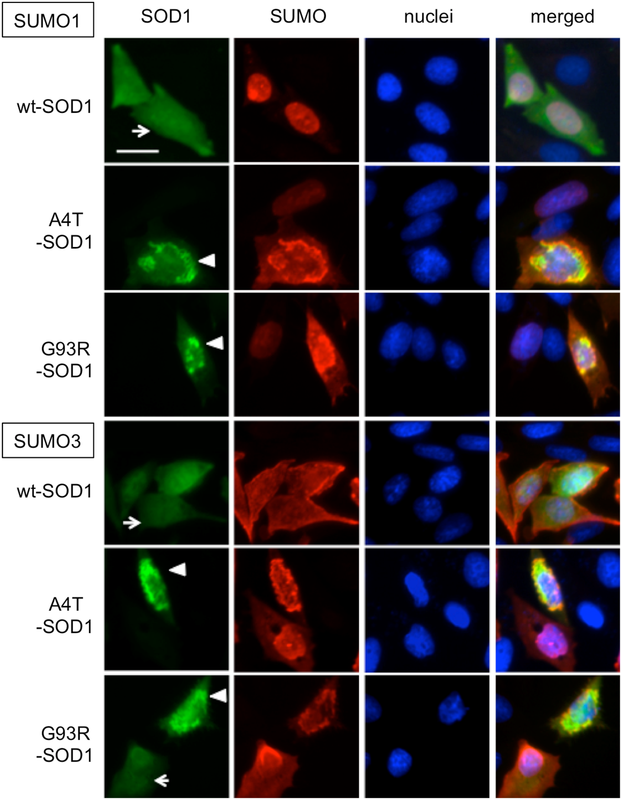 Human iPSC-derived motoneurons harbouring TARDBP or C9ORF72 ALS mutations are dysfunctional despite maintaining viability. Nat Commun. 2015 Jan 12;6:5999. [PubMed].